Everglades National Park contains a vast subtropical wetland centered on a fresh water river, with sawgrass marshes and mangrove islands. The park holds the largest continuous stand of sawgrass prairie in North America and the largest mangrove ecosystem in the Western hemisphere. It's the habitat of some 14 threatened species, including the Florida panther, snail kite, alligator, crocodile and manatee. It also is the most significant breeding ground for wading birds in North America. To be honest I'm not a fan of the USA. It lacks something in my opinion. But, I wouldn't be a UNESCO visitor if I would not visit the Everglades. I visited in combination with a 1 week road trip in South Florida. The Everglades are truly a unique nature place. So many various eco-sytems: mangroves, hammocks, pine forest, sawgrass priari and more! Spot the alligators and many kinds of birds. Even owls must exist and if you are lucky a panther! I recommend 2 days: 1 day the main road with 7 main trails to see all the eco system. 1 day Shark Valley by bike or walk and a fan boat tour nearby (they don't go in the official park). see site for photo gallery and the 7 trails. Read more from ch here. Everglades National Park just made it into this site's Top 200 (or more accurately 208) list, and I'm glad it got that recognition, since it is one of my favorite US parks. I visited the Everglades two weeks ago during National Park Week, which was celebrating the 100th anniversary of the US National Park system. The park has many trails and boardwalks highlighting different aspects of the wetland, from the sloughs forming a "River of Grass" to hardwood hammocks providing animal habitats to the salt water marshes that empty into the Florida Bay. Wildlife is abundant, including reptiles, such as alligators, crocodiles, and lizards; and an incredible variety of wading birds, including great blue herons, snowy egrets, pelicans, and roseate spoonbills. I was glad I brought my binoculars since there were so many opportunities to conduct birdwatching; I particularly enjoyed the walk around Eco Pond, near the Flamingo visitor center (though don't expect to see flamingos...). The Everglades is deservedly both a World Heritage Site and an International Biosphere Reserve, and is a must-see in southern Florida. Logistics: An automobile is the easiest way to navigate between the northern section of the park, with its Shark Valley loop trail, and the southern section of the park, with its visitors centers and numerous trails. Just a short drive from the hustle and bustle of Miami, the Everglades are a true wonderland of nature. The ecosystem covers a large part of southern Florida, but the national park only makes up about 20 percent of that area. It is still a huge park that, despite the well-known problems regarding pollution, water management, human encroachment, and invasive species, offers a wide variety of landscapes and a wealth of animal and plant species. Most people go by car, but if you don't have your own transport, there are basically 2 ways to visit the park (during a week in Miami, I tried out both). First, you can join of the many guided bus tours that take you to the northernmost edge of the park along the Tamiami Trail where the local tribes run several airboat businesses (our tour went to the Everglades Safari park, which also features a small zoo and an alligator show). This is the classic Everglades experience, and actually quite enjoyable (they turn off the engine after a while and you do get to see quite a number of animals, including alligators, snakes, and many different birds). The northern edge of the park is the only place where airboats are permitted (this area was only added to the park in 1989, the rest is a designated wilderness area; so I am not totally sure if this area is actually part of the WHS). Alternatively, the city of Homestead (on the eastern edge of the park) offers bus tours free of charge on weekends between late November and early May (called "National Parks Trolley"). This is the only public transport into the park and it worked quite well for me. The bus ride from Miami down to Homestead is really long and boring, but then the trolleys take you into the national park quite smoothly. They first stop at the Ernest Coe Visitor Centre, which has some nice exhibits on the history and ecology of the park, and then continue to the Royal Palm Visitor Centre, from where 2 easy hiking trails can be accessed - the Gumbo Limbo, a forest trail, and the well-known Anhinga Trail, which is mostly a boardwalk through a marshland, and which really lets you see the landscape of the Everglades, as well as many different animals. On each visit, I saw several alligators - the Everglades' and Florida's iconic animals -, and a wide range of birds, from vultures to cranes, but the famous mammals - manatees and pumas - are obviously nowhere close to the tourist trails. Mosquitoes, of course, are also everywhere, even though in winter, they are not much of a problem, and the bites disappeared after a few days... So if you don't mind the bugs, a visit to the Everglades is definitely a must for anyone spending a winter vacation in South Florida. Enjoyed the Everglades, especially Anhinga Trail at the entrance. So worth the time. Have never seen such a wealth of wildlife that are used to visitors. Photographers shouldn't miss it. The wooden walkways are convenient. Restrooms too. Gift shop, packaged food. Great blue herons, Little Blue Herons, Little Green Herons, Great White Herons, Limpkins, Ibis, Wood Storks, Purple Gallinule, & more. Photoed alligator "convention" & believe we also saw a crocodile. 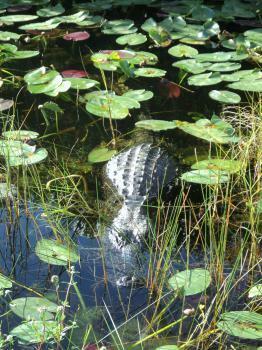 As I had plenty of time in Southern Florida in December 2011, I made three excursions into Everglades National Park. First I visited Shark Valley and walked more than half the loop, though a bike ride might be the better option as the loop is around 15 miles! Here we enjoyed the scenery of the Shark River Slough which seemingly never ends. The vast "wet prarie" is beautiful to behold. At Shark Valley we saw dozens of alligators, turtles, numerous bird species, and various types of fish. My second excursion into the park is really a nice place for families. Chekika is a small hammock that is the closest entry point to Miami. The area is small and recieves very few visitors, partly because it only re-opened in 2008. Furthermore, Chekika is only open December 1st - April 30th due to seasonal flooding. The Chekika area was originally a private park in the 70's, but was purchased and added to the national park in 1991. The site offers a pleasant picnic area that includes pavilions and grills. Some of the ruins from the old small park can still be seen. 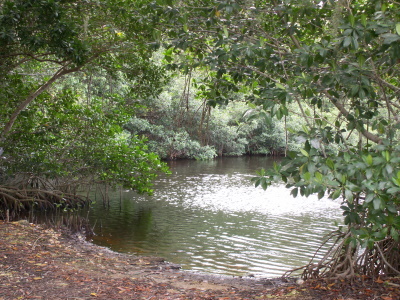 Entering Chekika, you walk around a small pond where alligators are sometimes seen. Further on there is a small (little used) trail that goes into the dense hammock. Chekika has some interesting history as well, being a major site of resistance from the Seminole Native Americans. I did not see too much wildlife here, various birds, and one Alligator. Lastly, I visited the major road that intersects much of the Everglades National Park. 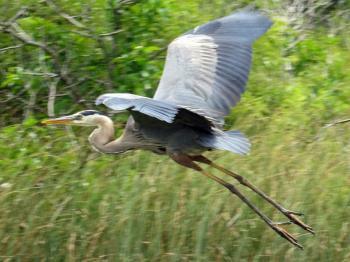 In the Royal Palm area there are two fantastic trails, Anhinga and Gumbo Limbo trail. Anhinga is well known for viewing wildlife during the dry season as the animals all flock to the abundant water here. Dozens of alligators, turtles, birds, and fish are all seen here in large numbers. The Gumbo Limbo Trail is a great place to walk amongst the lush vegitation of the Everglades. The foliage from the ground to the canopy was pleasant to take a walk through. Further along the road there is the pinelands trail, this trail had less interest for me, and while I did not really see any wildlife I could certainly hear it. It should be clarified there are numerous trails in this section of the park, most being around 1/2 round trip. However, there are some longer trails and also canoe loop trails as well. Following the pinelands there is the Pa-hay-okee overlook which is a great viewing point for the center of the park and the countless cypress trees in the area. The Mahogany Hammock trail was a nice place to see the difference a couple feet of elevation makes in the Everglades. Also on this trail besides the norm of seeing countless birds I did see a small water snake. After the Mahogony hammock the Everglades begin to change dramatically as the road approaches the ocean. At West Lake there is a nice trail that allows you to walk through the incredibly dense mangroves out to a small wood platform on the lake. The lake water here is very different than the clear water throughout much of the Everglades. Besides the short walking trail at West Lake there is also a canoe trail that goes all the way to Florida Bay. My final stop was at the Flamingo area where we enjoyed the visitor center and the view of Florida Bay. Here you can go on a boat tour, or rent out a canoe or kayak. The Everglades National Park was a worthwile place to visit. Here I probably saw more wildlife than any other National Park in the United States. While it does not have the majestic views offered by the Grand Canyon or Yosemite, I particularly enjoyed the vastness of the wet prairie, the lush vegitation, and the incredible wildlife found here. Next time I want to rent a canoe and take on one of the many long canoe trails found within the park. I think a better point to take a boat out onto Florida Bay (instead of Flamingo) is from Key Largo on the Keys. In this area I saw mangroves and many keys out on the bay, but I was torn between taking a boat out on Florida Bay or snorkeling at John Pennekamp Coral Reef State Park. Visiting the coral reef near Key Largo was alot of fun and I do not regret my decision. However, if I ever make it back to the Keys, I will definetly take a boat out onto Florida Bay. We finally made it to the Everglades last February. Outside of the Galapagos, it was one of the most amazing places I have been to see the variety of birds and wild life. I was not prepared for the amount of things we would see. February is a great time to visit....water levels are low so the birds, gators, storks etc are all around the watering holes. The Anhinga Trail was one surprise after another! The animals had no fear of us and there were fledglings everywhere! In the shark Valley we saw so many birds and gators with babies and even a manatee in one of the inlets! Down at the point, where the ranger station is; we saw active osprey everywhere and even a croc. The trip was amazing.....we also saw several barred owls and their babies and a horned owl. there was activity but it wasn't crowded. The weather was warm but not hot and bugs were nonexistent. The one bird we did miss seeing was the roseate spoonbill so we are going again this year, a week earlier and are anticipating another wonderful adventure. It is imperative that we maintain places such as the everglades and the other national parks. they are the true jewels of this country. visiting them restore ones sense of being and purpose. To truly experience the Everglades one must be willing to be somewhat adventuresome.A trip down the coastline in a kayak or a canoe trip into the interior is a camping experience of a lifetime. I see the tourist fly by in their automobiles, stopping just long enough to snap a few camera shots, then leave the same day...Camp overnight, go on a guided tour, rent a canoe, talk to the Park Rangers. Live for a few days out-side of the box and see what wonders this park has to offer..You won't be dissappointed.. The Everglades is one of 26 World Heritage Sites in danger and according to Smithsonian magazine, is currently "the focus of the world's largest environmental restoration project." It is the only place on earth that has both alligators and crocodiles living side by side. And contrary to what people say, it's a marsh, not a swamp because its main vegetation is grassy, not woody. I went to the Everglades in March 2003 to go canoeing with my husband. He wanted us to canoe for a day and camp on a chickee, a wooden raised platform above the marsh. I wasn't crash hot on the idea but little did I know that my husband had planned on proposing that night on the chickee. We canoed for a few hours but got terribly lost. We gave up on reaching the chickee and decided to turn back before the sun went down. Needless to say, I didn't get my proposal that night but a few nights later in Key West, right beside the Atlantic Ocean! I was not that impressed with the Everglades. seem to capture my interest or imagination. of going to the Everglades was of little touristic value. If you are visiting the man-made and theme park attractions or beach resorts of Central Florida it is certainly a bit out of the way to get down to the Everglades but, combined with a trip to Art Deco Miami Beach and out to Key West, it can be well worthwhile. The Everglades is situated only a few miles SW of the enormous Miami conurbation and is on the list of Endangered WHS both because of the effect of water usage and diversions “upstream” of the park which threaten to deny the area the water supply it needs to maintain its ecosystem and because of the pollution caused by fertilisers etc. It will be said of most US National Parks that you need to get out of your car to really appreciate them and this is perhaps particularly true of the Everglades. A large part of the Park consists of Florida Bay and its myriad of Keys (but the boundary runs just inside of Highway 1 down to Key West) and the land based part really only has 1 highway crossing it and another skirting the boundary to the North. It might have been nice to get out onto the water, whether on the Bay or on a canoe on the many canoe trails – but we had neither time nor skill. Neither did we particularly fancy an “Airboat tour” on craft driven by noisy airplane engines with rear facing propellers. So we made do with driving along most of the available roads and going on some of the walks. We decided to give the touristy “Tram Tour” at Shark Valley a miss and walked the tarmac-covered trail instead. We found this a very pleasant side trip and, once a tram has passed, you are likely to meet only the occasional cyclist. We were amazed at just how much wild life there was and are unlikely to ever walk as close to an alligator again. You are advised to keep at around 5 metres distance and my personal photos seem to show we (albeit unwisely) got a good bit closer! Apparently the Alligators out on land are more likely to be afraid of humans – but it still seems amazing that attacks are not so frequent as to require stricter safety measures! There is quite a range of scenery - from open “saw grass” plains with their “Hammocks” (dry “Islands” covered in trees and rising a few feet above the surrounding area) to dark mossy forested swamps. We were there in pleasant December – beware the mosquitoes from March to October! Most people wouldn't assosciate swamps with valuable real estate, but this park, encompassing almost the entire southern tip of the state of Florida, has an ecological value that goes beyond dollars and cents. This is nature in the raw, with all its random beauty just a few steps from Miami. Wildlife here isn't just present-it abounds, from alligators to turtles to flocks of our feathered friends. It's nice to see what little effect human habitation appears to have had in this remote yet accessible wilderness. I only had two hours to visit Everglades National Park and it was definitely not enough time; the park is huge! I was only able to visit the Anhinga Trail and Pineland Trail, both near the Ernest Coe Visitor Center and the main park entrance. I absolutely recommend the Anhinga Trail. 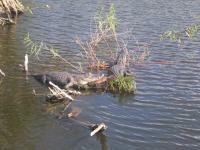 The wildlife there is amazing; I saw alligators, turtles and many different types of birds. I even saw a bird catch and eat a fish near the entrance. If you only have time to visit one place in the Everglades, this is definitely it. I left the trail fully satisfied. I could not believe I was actually in Florida. The Pineland Trail is also worth a visit although no wildlife could be seen here. My trip to the park was brief but it gave me a taste for a longer visit in the future. It is sad to note that the Everglades is one of only two endangered sites located in developed countries, the other being Dresden Elbe Valley in Germany. Update: The site was removed from the endangered list during the 31st Session of the World Heritage Committee in 2007. Biological Corridor: part of the "Florida Wildlife Corridor"
Irrigation and drainage: Several attempts were made to drain and develop the Everglades in the 1880s. Natural sites with indigenous human population: Some members of the Miccosukee and Seminole tribes continue to live within park boundaries. Holocene: "Only about 5000 years ago did South Florida's climate take on its current sub-tropical and monsoonal character of dry winters followed by hot moist summers with large amounts of rain (on average 50-60 inches per year"
Fatal Accidents or 'disasters': Crash of ValuJet Flight 592 in 1996, killing all 110 people on board. 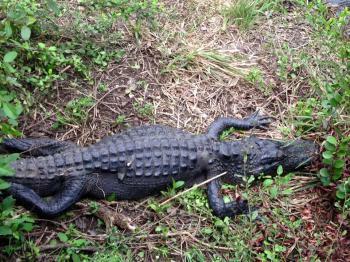 It crashed in the Francis S. Taylor Wildlife Management Area in the Everglades. Also: Eastern Air Lines Flight 401, causing 101 fatalities. Plus several smaller plane crashes. 267 Community Members have visited.